Email autoresponders are the quiet workhorses of email marketing. They toil away behind the scenes, working 24/7 to help automate your business. From first hello to loyal customer, they send your emails to the right people at the right time. They welcome new users, tell readers about your new blog posts, and continuously reach out to your audience with valuable content and relevant offers. But what are email autoresponders exactly? Basically, they are any type of automated email—sometimes even a series of emails—that you write once, schedule, and send automatically. For businesses, email autoresponders are powerful. When used right, they can help build trust in your brand and keep people coming back to your site. To help you get started creating your own email autoresponders, let’s dig into some examples, along with plenty of tips and advice to help you leverage this tool. Email autoresponders come in all shapes and sizes, but they all have one thing in common: they send automatically when triggered by a user action. These actions include joining an email list, downloading a lead magnet, buying a product, and shopping cart abandonment, just to name a few. The idea is that you create the content for email autoresponders in advance, and schedule to send at the appropriate time with the help of an email service provider, such as MailPoet. When you sign up for a newsletter, buy a product, or sign up for a service, you’ll typically see a welcome email land in your inbox soon after. These emails are simply a way to welcome new users to a brand. They usually contain “next steps,” such as other ways to interact with the brand (social media, blog posts etc. ), while some offer discounts or downloads. 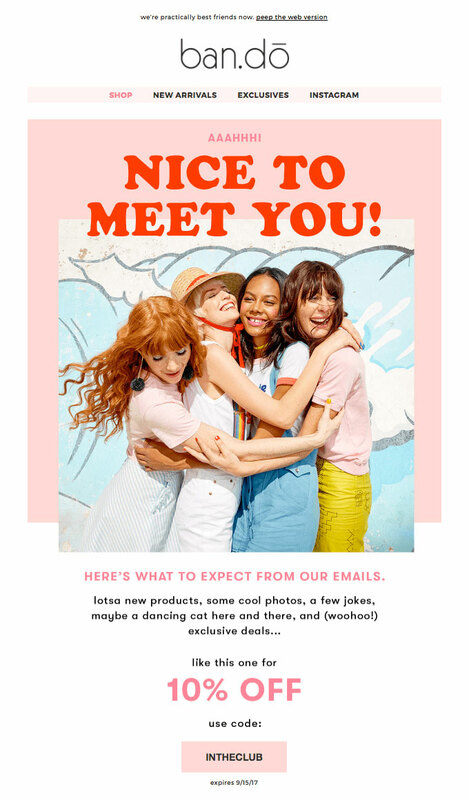 When you join lifestyle brand ban.do’s newsletter, you get this bright and colorful welcome email. It even includes a coupon just for signing up. An email course is a series of emails sent over a period of time (anywhere from two days to two weeks) that teaches a specific topic. Each email contains one lesson and the series is drip-fed to the subscriber every day for the duration of the course. Emails courses are a great way to show off your knowledge to prospects who are interested in what you offer but aren’t ready to convert just yet. In fact, you can create email courses using MailPoet—check out Creating an Email Course with MailPoet for a quick step-by-step guide on how to set up and schedule your course emails. 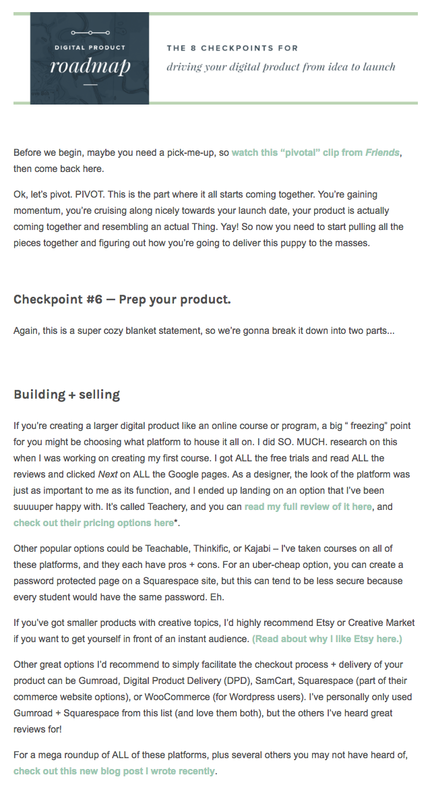 Designer Kelsey Baldwin, who runs Paper + Oats, offers a free 8-day email course called “Digital Product Roadmap,” designed to teach how to write and design your first digital product. These emails land in your inbox after you’ve purchased a product. They might contain items similar to what you’ve purchased or recommendations based on what you’ve previously bought. Whatever the case, these emails are designed to lure you back to buy more. If you run any kind of online store, these email autoresponders provide a simple way to encourage customers to return to your online store and explore your product range. 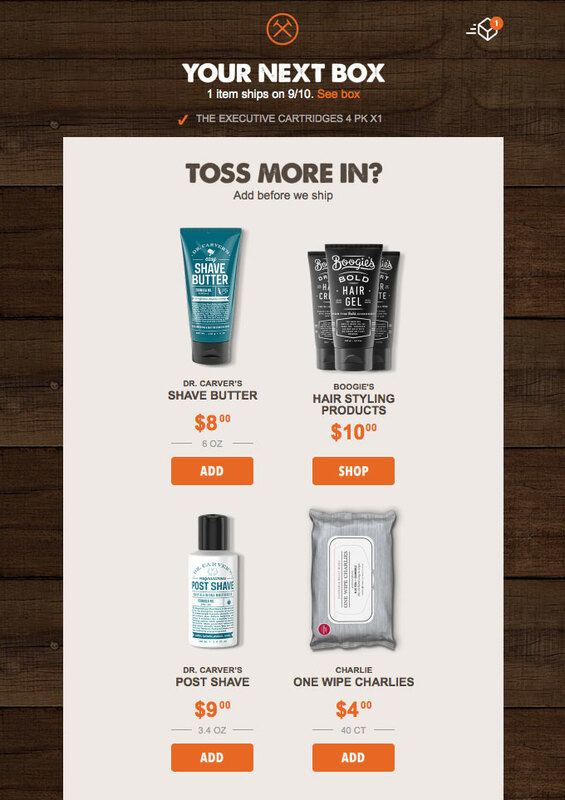 For example, when you purchase something from Dollar Shave Club, this great notification email not only lets you know about an upcoming shipment, but also upsells other relevant products that you could add to your order. These emails are designed to catch customers who’ve added an item to a shopping cart but haven’t completed checkout. They provide a subtle nudge, reminding customers that they’ve left something behind and it’s waiting for them. With 67.45% of online shopping carts abandoned, this type of autoresponder is a must for online stores. 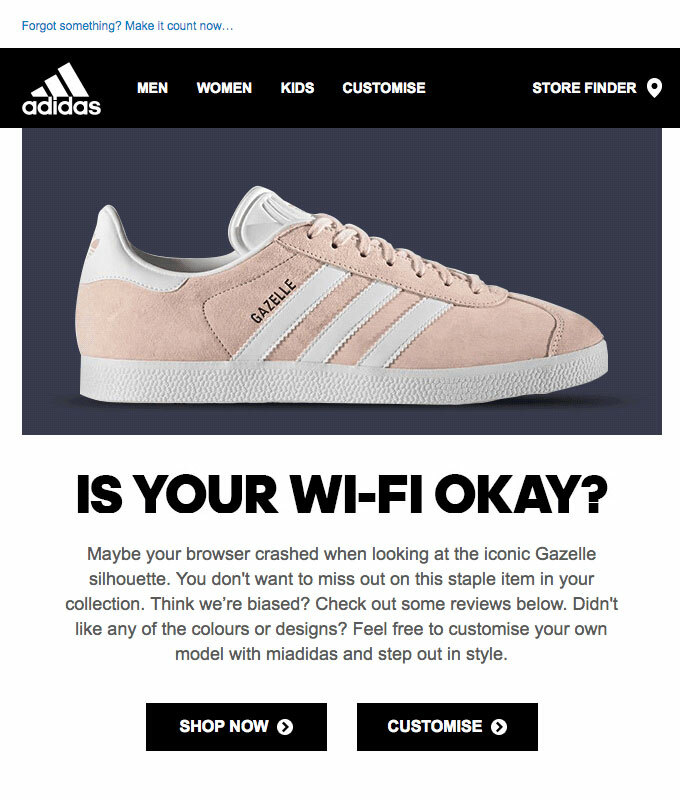 A great example is this abandoned cart email that Adidas sends to its customers. It’s fun and presumes there’s a problem with the customer’s wifi (and not that the customer may have just changed their mind…). Most importantly, it includes clear CTAs to help the customer return to their website and successfully check out. Some say email autoresponders are a lazy approach to email marketing and I completely agree. But they’re certainly not lazy in a bad way—they’re lazy in a great way! Once set up, they do all the hard work for you, sending automatically and saving you time so you don’t have to write and send emails manually. Most businesses have an email list, or have started building one. You might even have a welcome email set up already. This is a great start! You’ve already got one email autoresponder in place that’s rolling out the red carpet for your subscribers. But why stop at one? There are plenty more types of autoresponders you could set up to automate different aspects of your business. They give prospects a taste of what you have to offer. Sometimes, people simply aren’t ready to buy and want to get to know your brand first. They enable you to deliver valuable content to your subscribers. This might include your latest blog posts, an email course, ebook, or content from your archive. They help people stay in touch with your brand. Whether it’s a potential customer who’s interested in your business and wants to buy later down the track, or others in your industry who want to keep tabs on your company’s success. They ensure subscribers don’t forget you. Simple emails like win-back campaigns and abandoned cart emails keep your brand front of mind. Deliver the same great experience to every subscriber. You can ensure the same quality experience whether a user is receiving a customer service email or a promotional offer. Let you sent relevant and personalized offers without sounding salesy. Sending a sales email to someone out of the blue can come off a bit sleazy. But when someone is already engaging with your brand they’re more likely to click through and convert. Most importantly, email autoresponders enable you to build trust with your audience slowly over time. With email autoresponders, you have the golden opportunity to build a long-term relationship with your subscribers from the moment they join your list. And with the right emails in place, you can take subscribers from know to like to trust—and eventually nurture them into becoming a loyal customer. No matter what kind of email autoresponder you want to create, there are some steps you should follow each time to ensure your series has the best chance of success. Before you log into your ESP and start writing your emails, consider your goal. What is it that you want to achieve? Do you want to establish and nurture a relationship? Do you want to launch a new product? Do you want to promote services? Do you want to upsell or cross-sell? Do you want to demonstrate your industry knowledge? If you want to establish and nurture a relationship, consider a welcome email, case study, success story, or resource list. If you want to sell more products, abandoned cart, upsell, cross-sell, and sales emails are effective. If you want to demonstrate your industry knowledge, email courses, sharing blog posts, and promoting your podcast can help show off your thought leadership. The purpose of any autoresponder, other than to be useful and informative for subscribers, should be to move subscribers deeper into your email marketing funnel. So make sure you have a clear goal in mind before you write a single word as this will dictate the strategy for your email series. If you’re creating a series of emails rather than just a one-off, outline for your sequence from start to finish. For each email in your sequence, describe the purpose of the email, its call-to-action, and what should trigger it to send. Goal: Welcome new customer and offer a coupon. Trigger: When customer signs up for newsletter. Email 2: Follow on Instagram. Goal: Encourage subscribers to follow your Instagram account. Mention there are sometimes one-off promos and events announced on Instagram. CTA: Follow us on Instagram. Trigger: Sent one day after signing up. Goal: Promote weekly Sundae Sunday event and invite user to come to the next one. Trigger: Sent three days after signing up. Actually writing the copy for your emails might be the hardest thing about putting an email sequence together. You may even want to consider hiring a copywriter to help you. Many email autoresponder series aren’t very good because they focus too heavily on the brand. While it is important that your emails convey your message, they also need to focus on the user and their needs. It’s important to keep in mind that when someone opens your emails, they want to know what’s in it for them. Otherwise, why should they open future emails from you? So rather than talk about your products or services and how amazing you are, which is what so many companies tend to do, think about how your business can solve your subscribers’ biggest pain points. Load your content into your email service provider using any existing templates you have in place to ensure your sequence matches your branding. Then you’ll want to schedule your first email and set a trigger (in the case of the ice cream store, when someone signs up for the newsletter), and then go ahead and set up subsequent emails. Depending on your ESP’s capabilities and the goal for your sequence, you may want to set up your emails to be delivered as a drip campaign (i.e. send an email every day until the campaign ends), or as a behavior-based campaign (i.e. send emails when a user triggers an action, such as abandoning a cart). Once your sequence is set up, test it thoroughly to make sure everything works properly and triggers are actually firing. Then you can sit back and relax, knowing that your email autoresponders are automatically taking care of your email marketing for you. It’s important that you regularly review the content in your autoresponders to ensure the information is up-to-date. You might even want to add new emails to your sequence as your business grows. Tracking your emails over time will allow you to measure their effectiveness. So add Google campaign URLs to your CTAs so you can monitor your emails in Google Analytics. For relatively little effort, email autoresponders can help you deliver valuable content to subscribers, raise brand awareness, and send relevant offers to people who want to know more about your business. If you don’t have an email autoresponder in place already, start with a simple, single welcome email and build on that. Over time, review and update your emails, but also experiment with content and timing. Lastly, don’t forget to focus on your subscribers! When you deliver valuable content that they look forward to seeing in their inbox, it will help establish long-term trust in your brand. I agree with this 100%. It gives a great boost to your business cos it makes people feel like more connected with you. Hi, I would like to subscribe for this webpage to take most up-to-date updates, therefore where can i do it please help.